This year’s Monster Dash “tech” t-shirts will be a mix of a poly/cotton material made to wick moisture away, but not be quite so light and clingy as in the past years. Perfect for a warm run or a workout at the gym! This year’s shirt design is pictured here. With the much appreciated sponsorship of Aztech Screenprinting and Design, we are able to leave the t-shirt prices the same as last year. 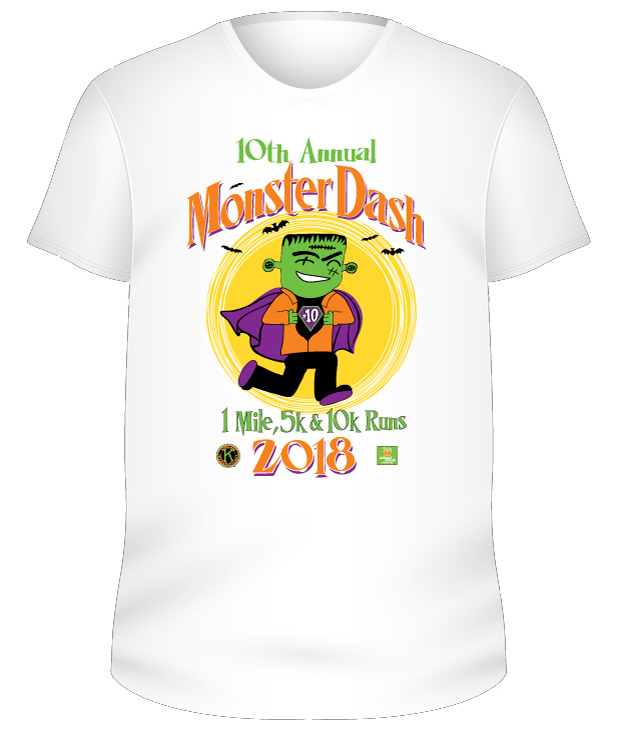 Shirts can be purchased through Oct 15 on your paper 2018 Monster Dash registration form (see Register page) or when registering online with the registration button to the right. A limited number of shirts will be available for sale during the Friday & Saturday Monster Dash events for an additional $5, while supplies last. Shirts at the events go fast and often sell out before race time. Don’t miss out – pre-order your shirt with your registration by Oct 15!